Town still lead the Hallmark Security League’s First Division North table with three games remaining. However, last Saturday’s 3-0 loss at Lower Breck means Town are only five points ahead of Avro, who have two games in hand. The first of those is played this evening when Avro host Cleator Moor Celtic, meaning the gap could be cut to two points going into the Easter weekend double-header. “To be honest, we didn’t deserve to get anything from the game at the weekend,” Ashcroft said. “I questioned the players and they know I wasn’t happy with them. 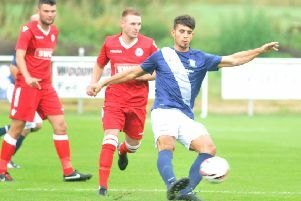 Town host Nelson on Saturday before looking to get the better of Garstang when they travel to the Riverside on Monday afternoon. They go into Saturday’s match on the back of a wobble which has seen them win one of their last four matches. “We have been in fantastic form up until the last three or four weeks,” Ashcroft said. “We will go again on Wednesday when we’re back in training and, hopefully, we will have a big crowd getting behind us on Saturday. “Then we go to Garstang on the Monday and finish off at home against Holker Old Boys next Saturday, so it’s a massive week for us and we’ll be looking to take nine points. “Avro have had a lot of games but, if they win their last five games, they deserve to be the champions.